It’s time for another installment of the Style Profile Q&A series! 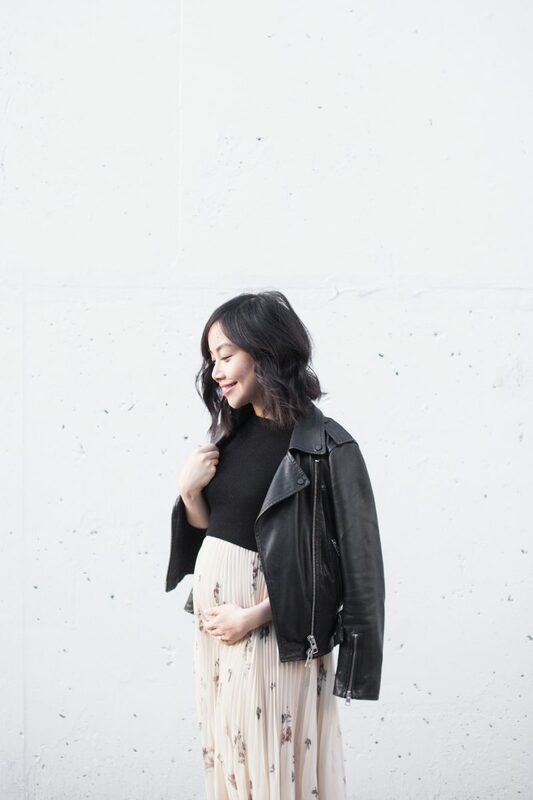 Today I’m welcoming Jen Tam (@herwaisechoice) to join us for a chat about her approach to conscious consumption specifically when one is expecting! Jen is one of few instagram friends I’ve been fortunate enough to meet IRL and believe me when I say she is every bit as stylish and lovely as her blog and social media suggest. Not only does Jen have impeccable taste (guess who convinced me to try the white Day Glove?) and a fabulous smile but she’s also been an inspiration when it comes to approaching maternity style thoughtfully. I’ve been so impressed by Jen’s ability to push the versatility of her existing closet while adding carefully considered items to help her stay true to her style as her body undergoes some significant and rapid changes. We had the chance to catch up over tasty diner eats in Vancouver while chatting about the world of conscious fashion and the pressures of blogging while trying to maintain a lean closet and a grip on reality. 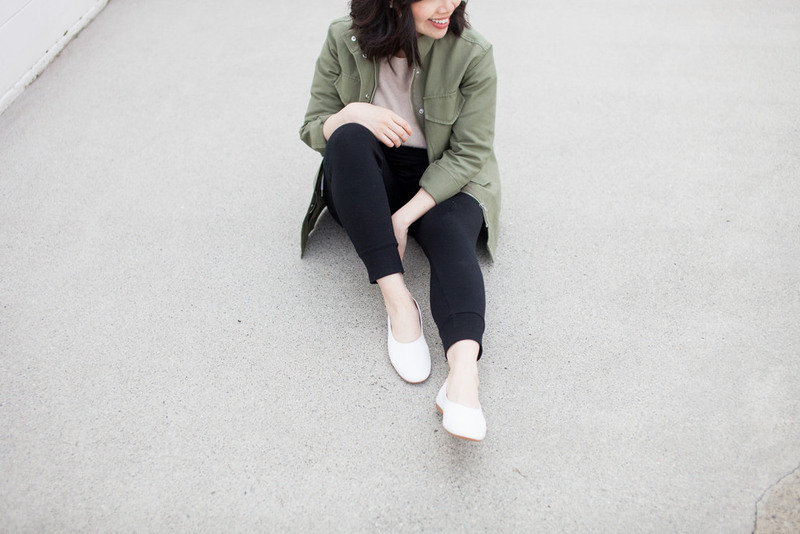 Whether you’re expecting or not, Jen has some very sound tips when it comes to consciously curating your closet! 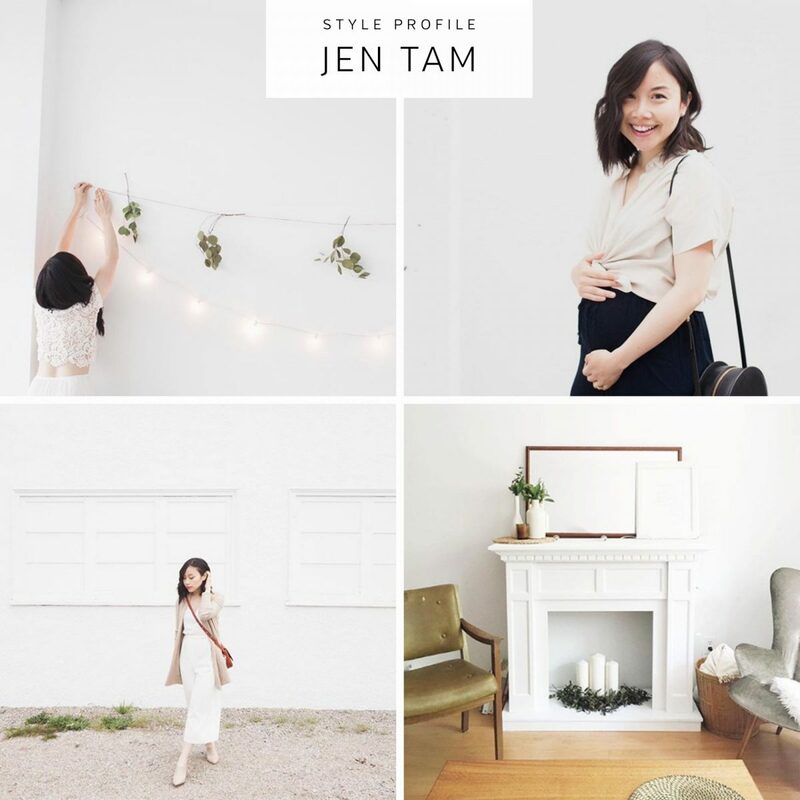 Grab yourself a hot coffee (if you have A/C) and a comfy seat for a fresh Q&A with the bright and beautiful Jen Tam! Tell us a bit about yourself and how you found your way into style blogging and then into a more conscious approach to shopping. I started my blog years ago when I was still in school. 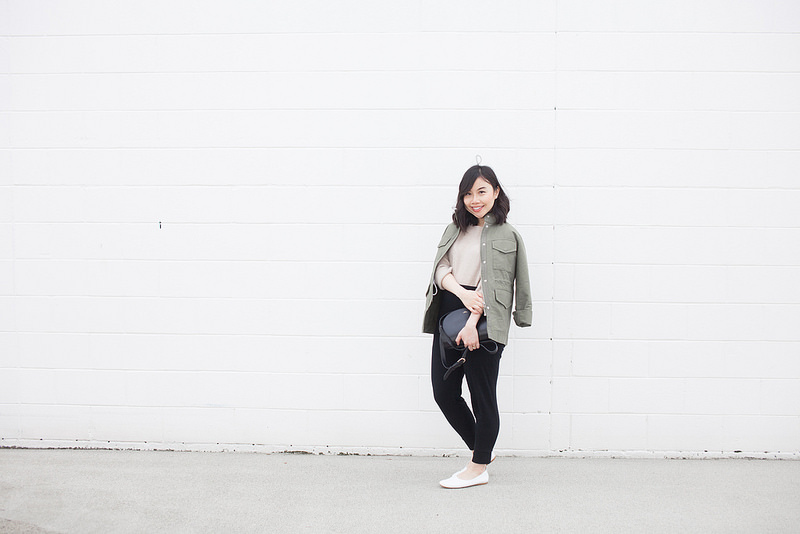 At the time, I was reading a lot of fashion blogs and on a whim decided to start one to document my own style. There was no real plan or purpose, but as soon as it picked up a bit of traction I got caught up in the cycle of shopping all the time to keep my content interesting and my audience “happy”. For a long time I felt compelled to buy something new every time I posted, and since I was on a shoestring budget that often meant fast fashion and quick fixes. I ended up with the classic mess of an overflowing closet and nothing to wear. That said, my conscious approach to shopping actually came as a result of personal changes in my life that had nothing to do with clothes at all – it began with a break up from a long term relationship that made me question just about every choice and direction in my life, and how others were impacted by it. To keep it simple, I soon realized there was no way I could divorce the changes in my life from the clothes I wore and how I shopped, so it was kind of a natural transition. I have so admired your approach to maternity dressing. How has navigating a rapidly changing body influenced your style and closet? 1) Stay true to my style as much as possible. 2) Not add anything to my wardrobe that I won’t be able to continue wearing afterward. It’s my first go at this pregnancy thing and it hasn’t been done perfectly, but for the most part I’m happy with how it’s worked out. 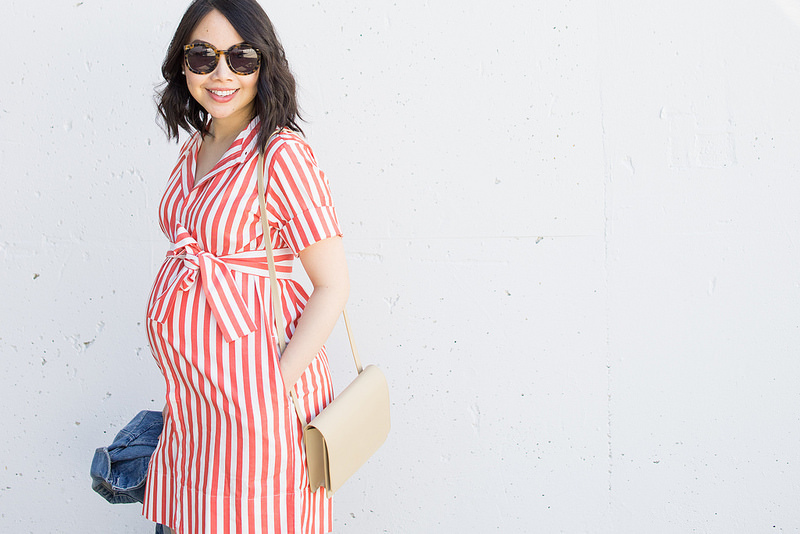 Although I haven’t had as many options to wear as I would’ve pre-pregnancy (I’m nearing the end of my third trimester and rotate between just 4-5 outfits now), but it does make me realize that I need even less than I think I do. What have been your top 3 closet heroes while expecting? 1 | My silk slip from Storq has been a go-to and is perfect for the most casual of days to the dressiest evening affair alike. It’s great quality, machine washable, and is one of the rare pieces that still makes me feel put together these days. 2 | I have flat, wide feet so don’t find a lot of shoes comfortable, but my Everlane day gloves have been on my feet almost every day. I spent a lot of time walking during my second trimester, and these ones definitely racked up the steps. 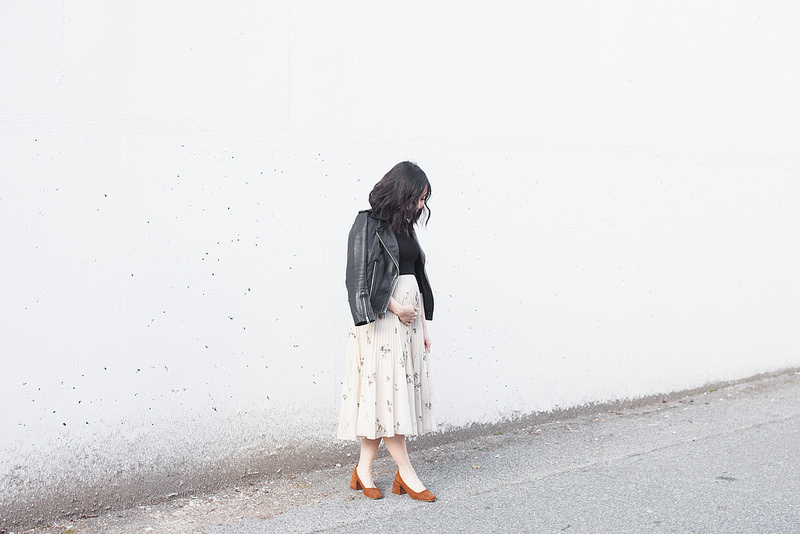 3 | Lastly, my husband helped me choose a pleated floral print Aritzia skirt when I was just starting to pop, and I purchased it two sizes up from my pre-pregnancy size to keep wearing as I grew. He usually has zero involvement in my style choices so this piece feels special whenever I pull it out. The skirt itself makes me feel feminine and beautiful on the days where my body feels foreign to me (which happens a lot!). At 35 weeks now it still fits, and I plan on getting it altered to keep wearing after baby comes. What are your top style tips for pregnant women who want to make the most of their closet and add items selectively? Go slow, and don’t be quick to write off your existing wardrobe! My jeans were the first to stop fitting, but I found that many of the pieces I previously owned could still work during pregnancy with a bit of creativity. For instance, all of my jackets still work (unbuttoned or unzipped, of course), and pieces like button up shirts can be tied at the waist. I’d recommend spending some time trying on what you own as your body changes and have fun with it if you can, then fill in the gaps as needed. Keep in mind that your body will also continue to rapidly change over the nine months, so resist the urge to get too much once. Also, do what works for you personally. I thought I needed maternity jeans since I wore denim a lot before pregnancy and they seem like such a staple, but every pair I tried on just felt uncomfortable. I ended up buying a pair of maternity boyfriend jeans for something like $7 at a consignment shop, but still haven’t worn them enough to justify having them in my closet. 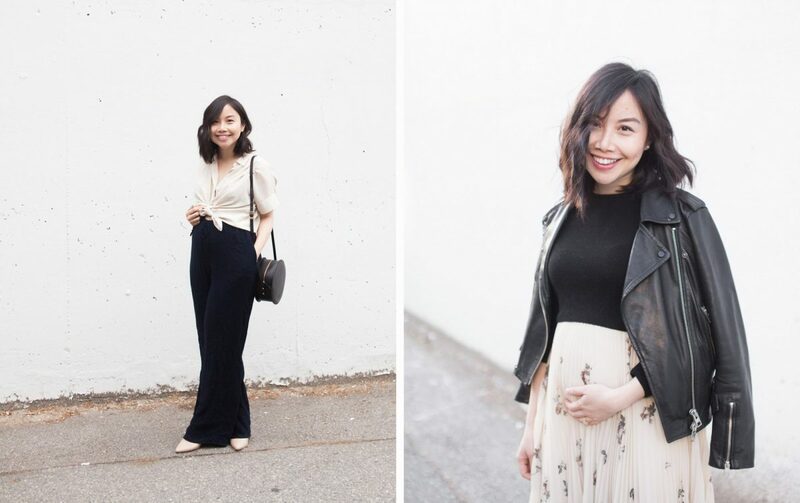 Lastly, I’ve stayed away from traditional maternity clothes as much as I could, since I’m not crazy about the idea of clothes that don’t fully suit my style and are just to be worn for a very short season. I did, however, buy a pair of bamboo maternity leggings…and I couldn’t live without those. We connected over a mutual appreciation for conscious consumption and a ‘Buy Less, Choose Well, Make It Last.’ mentality. Why is this important to you? Aside from the global impact of unconscious consumption on both people and the environment, I do think it’s a beautiful thing to take pride in the clothes that we wear and the way we dress our bodies. Having fewer items that are more thoughtfully considered allows each piece to become special, and helps me appreciate every garment for the way it’s made and how it adds to my closet. What has/have been the biggest challenge(s) with this approach to fashion? Truthfully, it’s most challenging to stay content with what I have. I’m drawn to the cuts and small details in clothes, so sometimes I’ll have something for a couple of years and pull it out one season only to realize I don’t quite like the way a pocket is stitched or the way a collar lies anymore. The piece will still be perfectly fine otherwise, but I’ll feel the need to “update” it to perfectly suit my current preferences. I haven’t really found a solution to this one yet, but knowing this about myself, I try to go as classic as possible when adding to my wardrobe. Care to share a few of your go-to brands for chic maternity style and quality that stands the test of time? My favourite brand during my pregnancy has been Storq. They make simple, good quality clothes that make you feel like yourself, which is exactly what I want in a maternity wardrobe. In addition to the silk slip dress I also have their jumpsuit, mini dress, and diaper bag. I recently purchased the super soft maternity and delivery robe as well in anticipation of the many hours I’ll be spending at home over the next few months. Even though these pieces are technically for wear during pregnancy I know they’ll still work postpartum and beyond. 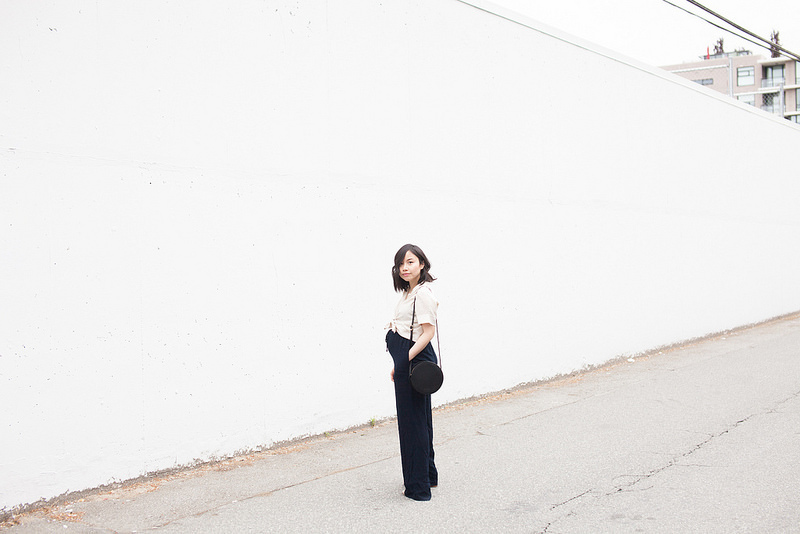 I also wear a lot of Everlane, since their cuts, styles, and price points work well for me. 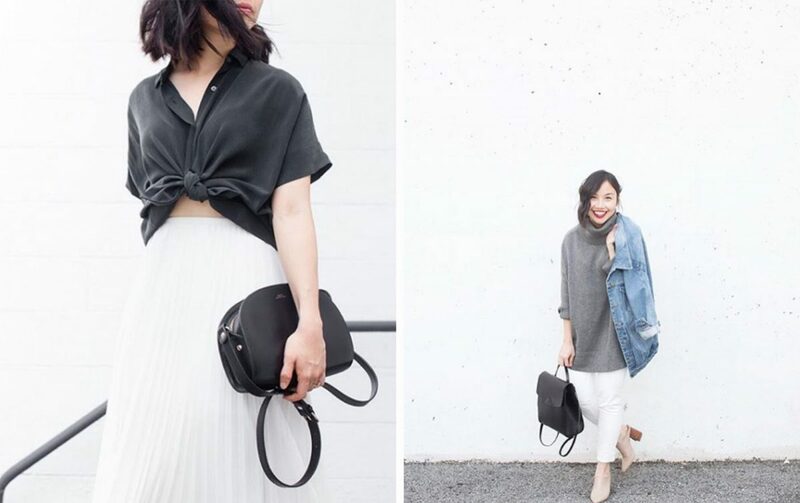 What makes a great outfit for you? Is this the same as when you weren’t expecting? To me, a great outfit is one that makes me feel comfortable, confident, and pulled together without too much effort. I like to keep things very simple with one or two elements to elevate the look, whether it’s with a great pair of shoes or a luxurious coat. I think this is how I’ve defined a great outfit to be for years, it just took awhile for me to get comfortable enough in my skin to not overcomplicate things. Can you define your style in 3-5 words for us? Do you have any items on your fall wish list? At the moment, not really – because I can’t fully anticipate how my body is going to recover once I give birth, and how much the lifestyle change is going to impact the cuts and materials I wear, I’m going to see how my existing pieces work for me once I do and go from there. That being said, my weakness during the fall is always an elegant, wool/cashmere “coatigan” that can tie the simplest of outfits together, and I certainly wouldn’t be opposed to one from Lauren Manoogian! Listening to: Anything and everything at the moment – trying to diversify the music that baby is exposed to in the womb! I always have CBC radio on during my morning commute. Watching: I’ve been watching a Spanish TV series on Netflix called Money Heist with my husband. It’s a thriller, which isn’t what I usually go for, but it’s so good! I also really need to watch Handmaid’s Tale Season 2. Reading: The Big Book of Birth to educate and mentally prepare myself for what’s happening next month! 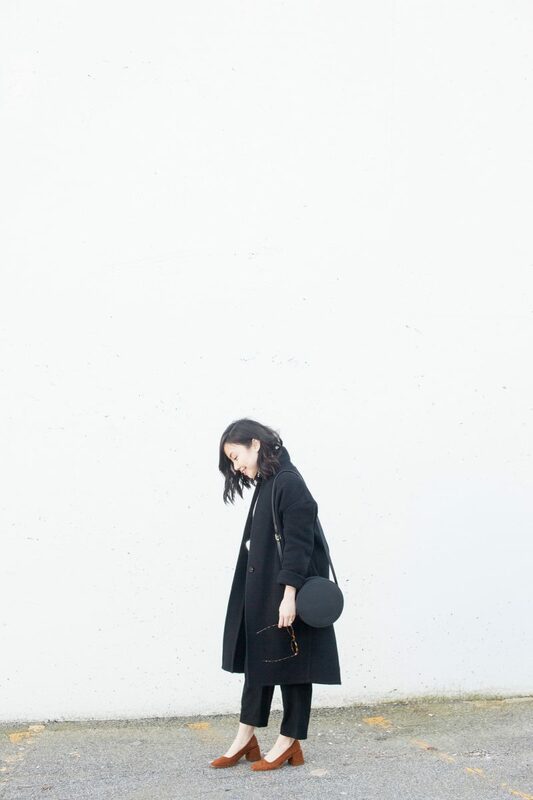 THANKS SO MUCH TO JEN FOR SHARING HER BEAUTIFUL IMAGES AND INSIGHTFUL TAKE ON PERSONAL STYLE WITH US TODAY! WISHING JEN ALL THE BEST AS SHE ENTERS THIS NEW PHASE OF LIFE! Having fewer items that are more thoughtfully considered allows each piece to become special, and helps me appreciate every garment for the way it’s made and how it adds to my closet. Truthfully, it’s most challenging to stay content with what I have. The piece will still be perfectly fine otherwise, but I’ll feel the need to “update” it to perfectly suit my current preferences. This is how I’ve defined a great outfit to be for years, it just took awhile for me to get comfortable enough in my skin to not overcomplicate things. Hi, I always love to wear jeans. But currently, I am pregnant with my first baby. So, I have no ideas for maternity jeans. Can you suggest me any brand name which is comfortable for me? Thanks in advance for giving me the information. Maybe I missed it in the text, but do you happen to know where the black round bag is from? Thanks!! I love Jen’d style. I’ve been following her for years. I think a lot of expectant mothers could learn a lot from Jen’s wise style advice – keep wearing what you always have until you simply can’t, then buy things that you can have altered to your after birth body and stay as true to your normal, familiar style as possible. A woman’s changing body and the anticipated lifestyle changes ahead is enough to cope with without having to gaze in the mirror and see a woman you don’t recognize dressed in some frilly number she would never wear! Haha You are so right Kathleen! I totally agree that Jen’s approach is very practical and smart! Thanks for reading. I have two kids and both times I was pregnant I kept most of my normal clothes by adding a fabric band (think like the belt area of fold over yoga pants). I found it in the maternity section somewhere. It let me push my waistband below my belly and made sure my shirt didn’t ride up. It went over the pants and under the shirt. It was a wonderful option and I loved not having to get new stuff I wouldn’t fit later. I’m so glad to hear that Antonia! Isn’t Jen a delight? So happy I was able to share her great style and thoughtful take on fashion. Thanks for reading.